A friend gave me a spare Cape Gooseberry bush at the start of summer and it has settled in nicely to my garden. I’ve recently had the first fruits off it – the taste of the berries, which I haven’t eaten for many years, took me right back to being a kid. I used to take the long route home from primary school in late summer, so that I could walk past the house which had a giant Cape Gooseberry bush growing near the path, in the perfect spot for naughty schoolkids, like me. I would stand there and slide them out of their husks, popping them into my mouth and eating them until my stomach hurt. One of my favourite New Zealand poets, Lynn Davidson, has not one but two Cape Gooseberry poems in her book ‘Tender’ (Steele Roberts). I love this book very much and often return to it, although I don’t own it as I long assumed I did – I have Sarah Laing’s copy. I discovered this in the most embarrasing way. When Lynn Davidson read at the Palmerston North City Library last year as part of her stint as Visiting Artist at Massey, I confidently toted along ‘my’ oft-read copies of ‘Tender’ and ‘How To Live By The Sea’ to her reading, thinking it would be nice to get them signed seeing as I like them both so very much. Well, Lynn seemed pleased to see that I had both of her books and she opened ‘Tender’ to its title page – to my horror, her signature was already there, and a dedication ‘To Sarah’…it was one of those ‘World, swallow me up!’ moments. Lynn guffawed and slid it back across the table to me and opened up ‘How To Live By The Sea’ for signing. To my horror times a thousand, that book was also already signed – this time ‘To Lynn, with love from Lynn’. I remembered that Lynn Jenner had lent me her copy. CRINGE!! Luckily for me, Lynn Davidson thought it was hilarious and teased me with something like: ‘Typical tight poet!’ or some such – but my cheeks burned on through the night with embarrassment. Anyway, this is all a digression from Cape gooseberries. Eating my own Cape gooseberries, reminded me of the two terrific poems by Lynn. One of them follows. If you’ve never had a Cape gooseberry – well, they are strange and wonderful – the size and consistency of a cherry-tomato, but a lovely orangey colour and the most highly-scented, exotic flavour. Sort of like strawberries and limes and tomatoes all mixed together, except of course not really like that at all because the flavour is unique. In any case, they are delicious! You know they are ripe when the pretty husks they grow in go papery and brown. candle light. It attends to beauty. I love cape gooseberries. My grandparents always had a big bush and I remember in summer eating them in their garden in the Port Hills in Christchurch. I loved the rustle of the papery shell and then the berry inside. Also, that is such a good story, even if it is embarrassing! I always feel like sharing embarrassing stories when someone tells me one! This time I’m going to save it for the next time I see you! Hopefully soon! I do love that poem! And I do love cape gooseberries, or at least the look of them. They tasted weird to me as a child, sweet, tangy and savory. Are you growing tomatillos? They are a lot like tomatillos. Yes! 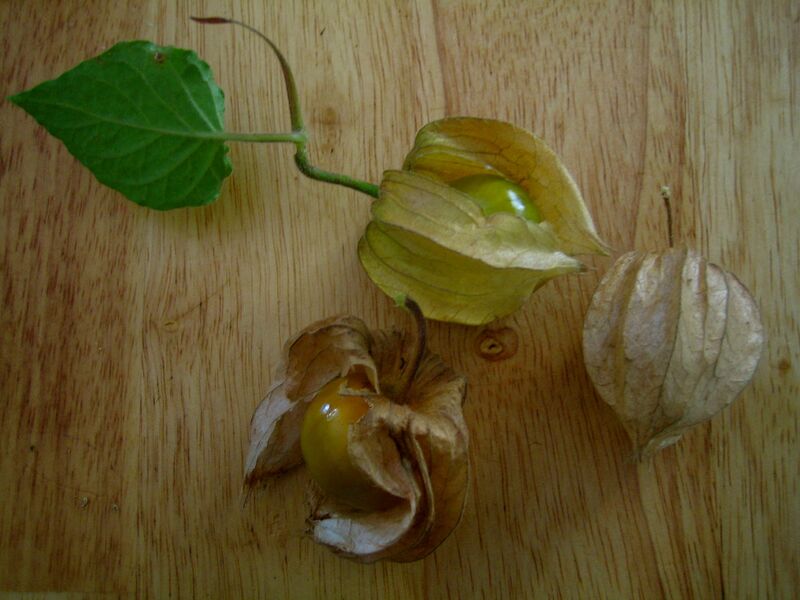 I have two tomatillo plants which are yet to fruit. I hope they make it before the weather gets cold!